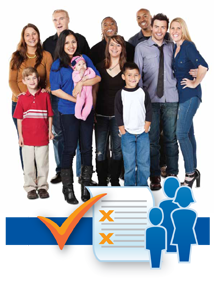 Health Decisions clients on average have removed 7% of dependents as a result of our Dependent Eligibility Audits. Chicago, Illinois, September 26, 2013 – Si Nahra, President of Health Decisions, Inc., was the featured speaker at a recent workshop titled “Leveraging Data and Consultative Sales Process in an Era of Revolution,” presented by Oceanus Partners. The two-day session at the downtown Hilton Garden Inn focused on training brokers in how to write and retain large group health accounts. Topics covered in the workshop included fiduciary responsibilities, recovery processes, monitoring and management, and compliance. Welcome to the regulatory roller coaster. The announcement of the one-year delay in implementing the employer "Pay-or-Play" reporting provisions under the Affordable Care Act (ACA) is here. The delay relates to what information health plans will need to report to the IRS. It does not change Minimum Value and Affordability tests or alter eligibility rules and offer tests. However, these may change as a result of changes to reporting requirements. We are encouraging our clients to use this time to assess whether they can combine payroll history with enrollment history. This saves money by eliminating any ineligibles and tells you how prepared you are for Obamacare reporting once it is finalized. Please note that the delay in reporting does not affect other Obamacare requirements including the new ACA taxes and the new out-of-pocket limits. We'll keep you up to date as things inevitably continue to change. Earlier this summer, Health Decisions offered a three-part virtual seminar series on health reform support around the employer mandate regulations. The first webinar explored how new regulations completely change the way health plans handle cost sharing. The next webinar focused on the four levels of calculations associated with Pay-or-Play decisions every plan must make. And the third webinar looked at the steps called for by the new regulations and presents the positive side to “Obamacare” compliance. Health Decisions, Inc. is now active on Facebook, Google+, LinkedIn, YouTube, and Twitter. We hope to share with our past, current, and prospective clients our information based on our expertise with the specialized niche of health plan management and cost maintenance. We invite you to follow us on Twitter, like us on Facebook, follow and connect with us through LinkedIn, subscribe to our YouTube channel, and add us to your Google+ circles. We also feature content on Manta and Slideshare. Be sure to check back often to read articles and view our video content. Most internal audits of group health plans focus on confirming the accuracy of payments made for invoices received from the insurer or outside plan administrator. But who confirms if the invoices themselves are correct? This session "de-constructs" the health plan invoice into its five component parts and presents proven techniques for auditing each of those components. It concludes with a discussion on how internal auditors can complement HR professionals at an organization and produce financial returns that help underwrite audit activities. One of the most immediate and significant impacts of health reform for employers will be changes to dependent coverage rules. This webinar will explore what these changes mean for employers and, more importantly, what employers should do to prepare for the expected influx of dependent enrollments. Mr. Nahra and Mr. Eggertson will speak about "Coordinating Medicare Parts A, B, and D" at this invitation-only conference for Blue Cross plans around the country. Health Decisions President Si Nahra, Ph.D. co-authors chapter in “Cost Recovery: Turning Your Accounts Payable Department into a Profit Center"
This book by Richard P. Lanza provides tools to assist organizations generate cash recoveries, stop profit leaks, move away from control issues, and work towards process improvements. The book shows how to incorporate profit recovery technology, and how to pair a company with a recovery expert best suited to the company's needs to achieve bottom line results. With 15+ years of experience, experts in medical claim and enrollment auditing Si Nahra, Ph.D. and Judy Mardigian will share best practices and discuss the dependent audit process, timing, and expected savings. Medicare is aggressively cost shifting onto Blue Cross Blue Shield and other private group health plans. It has a myriad of programs designed to find out when it is the secondary payer and collecting those payments. However, it makes no effort to determine when it is the primary payer and owes money to a private group health plan. At this session, Si Nahra, Ph.D. will present case studies highlighting proven techniques to document Medicare as the primary payer under Parts A, B, and D. Attendees will gain insights into practical strategies to help balance and address the one-sided cost shift from Medicare.